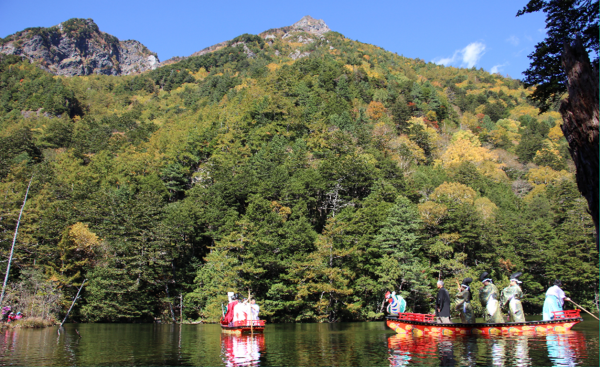 Visitors to Myojin Pond got to observe a rare spectacle on Monday, October 8th when the annual O-Fune Matsuri (“Boat Festival”) was held. 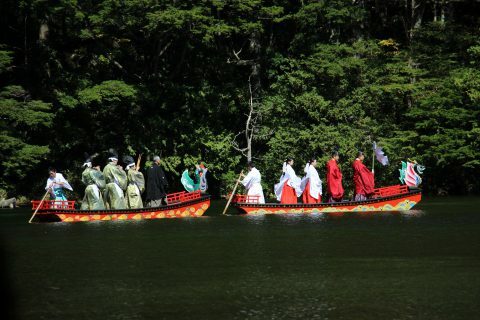 From around 11am, a delegation of priests and shrine maidens boarded two brightly colored boats and proceeded to the center of the pond to conduct prayers in thanks for safe passage through the mountains. It’s one of the yearly reminders that the season is drawing to a close and a highlight of the autumn season. For those unfamiliar with Yari, or Yarigatake to give its full name, it’s that Matterhorn-like peak in the background. At 3,180m high, it’s also the fifth highest peak in Japan. More than altitude, however, the mountain takes its iconic status from its striking shape and colorful history. First ascended by the Buddhist Priest Banryū in the 19th century, Mount Yari would also attract such luminaries as William Gowland, Walter Weston, and the trailblazing winter climber, Maki Yūkō. Tengu Pond is a popular landmark on the way to Yari and it’s probably fair to say that it’s at its most scenic in autumn. Just look at that peak reflected in clear waters with colors adding the perfect accent to the foreground. Bravo, NPG! 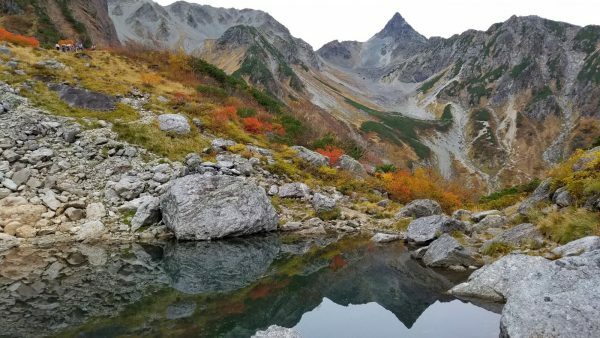 Since not everyone makes it up to Tengu Pond, we should probably show you some of what’s going on in central Kamikochi. Photographed within the last week, these maples by the Azusa River are already displaying bright red hues. 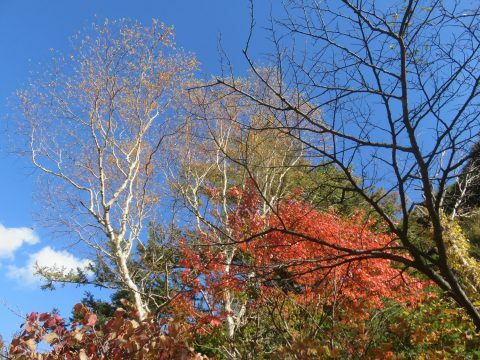 That doesn’t mean that all maples are peaking at once, however, as the peak period and intensity of color depend on such factors as the species and health of individual trees. 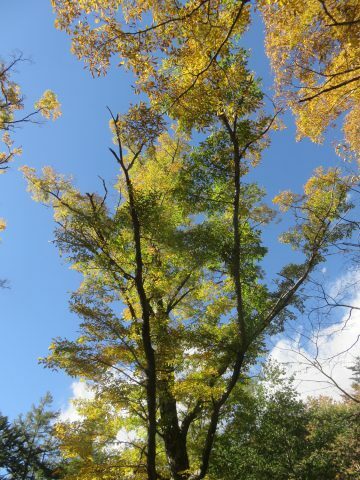 It’s safe to say that if you visit Kamikochi between now and the final third of October, you’ll see some red and orange leaves, along with perhaps some yellow larches. This one hasn’t hit peak yet, but it’s surely a matter of a few days at this point. Firstly, as I say year after year, the autumn season is a lot more enjoyable when the weather is good. Personally, I think that’s more important than trying to pinpoint the exact time when the colors themselves peak. Deep blue skies mean both superior backdrops to your photos and better lighting–as well as of course warmer, more agreeable conditions during the day. Secondly, if you must visit Kamikochi on a potentially rainy day, be sure to prepare adequate rain gear as well as warmer clothes to counter the temperature drop. You can get pretty soaked on that one hour hike from Taisho Pond to Kappa Bridge, so don’t get caught unprepared! Thanks as always to the bloggers at NPG for all their hard work and invaluable information. It’s a real blessing to everyone planning to visit Kamikochi.